The ice is a second home. It’s a place of comfort where nothing else matters. You can escape life, the stresses of work, school, drama, etc. It’s a place where you can be yourself and not have to worry or think about anything else. THE OLYMPICS ARE HERE! After a long awaited four years, the winter Olympics are back. I have been so excited to watch; however, I have been struggling to find an easy to read figure skating tv schedule for the Olympics. Below is what I hope is a correct listing and easy to read schedule. Let the games continue! It doesn’t matter what happens in life; the ice is always there. It is our life, our sanctuary, and our passion. It has been a few months since I have been able to bring myself to write anything skating related. As much as it pains me to say it, I had lost myself and I thought I had lost my love for skating. Skating was and always has been who I was. Every moment I lived and every breathe I took was for skating. Somewhere along the path of life, I had suffocated and lost the affection for skating I once knew. My life became consumed with working every minute of every day. From coaching to expanding my business, there was always something to be done. I needed new photos for my business and great oppotunity to Paris presented itself. Many people only dream of going to Paris, and even though I love Paris, since i had been there multiple times I wasn’t as excited as I should i have been. At the time I would have rather stayed home doing nothing than stressing about getting “good shots” for next seasons line. What was supposed to be a a business trip turned into an experience that brought me back to who I am. It was the oxygen I needed to feel alive again. As soon as I got on the plane and heard another language besides English, my frame of mind had immediately changed. I was instantly inspired and the inspiration kept growing with every moment I laid foot in France. The show I went to visit was called Passion which was a portrayal of a skaters life. From training, to competition, to how skating was a part of each skaters life. There was one section in particular that had moved me so much that I wasn’t even able to hold up my camera. The scene was set with a few skaters each telling their story of skating from around the world in their native language. From being told they weren’t good enough, to losing a family member and their skating family became their own, to having skating be “their most consistent relationship.” It was a heart jerking and awe inspiring scene. As much as I tried to hold back, tears kept rolling down my cheeks. It was the reminder that I needed, that no matter what happens in life, skating is who I am. There were only a few select skaters who were chosen to tell their stories during the show, but it made me curious to ask others on the cast about their story. With every story I heard, I was more inspired and impressed. The struggles and strife that skaters from around the world have gone through is unbelievable just to be able to skate. What kept them going? What made them push through the pain and misfortune? Passion. Their passion had led them to an incomparable and amazing experience of being a show skater. Passion could not have been a more perfect name or theme for the show. Prior to watching Passion, I felt as though I “had” to put my skates on. 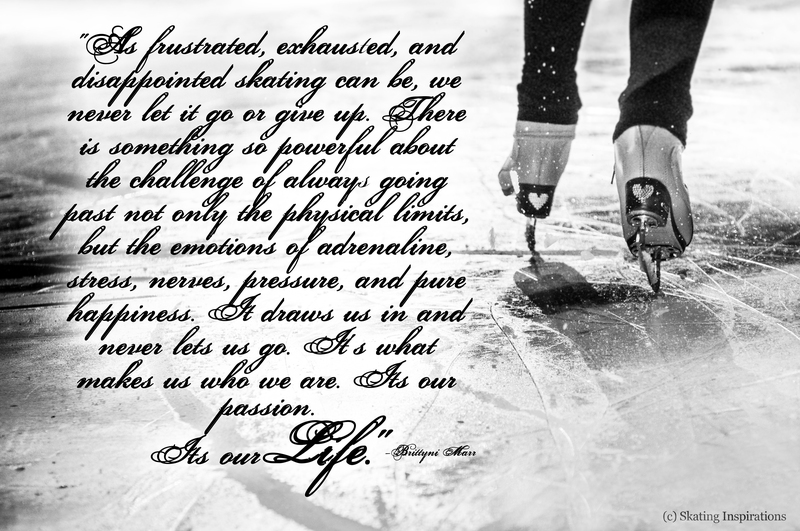 But after the beautiful reminder, I feel blessed to be able to lace up my skates. It doesn’t matter what happens in life; the ice is always there. It is our life, our sanctuary, and our passion. If you have passion you can and will be successful. Most importantly, you will find happiness. As frustrating, exhausting and disappointing skating can be, we never let it go or give up. There is something so powerful abut the challenge of always going past not only physical limits but the emotions of adrenaline, stress, nerves, pressure and pure happiness. It draws us in and never lets us go. Its what makes us who we are. It is our passion. It is our life. Its the holiday season and along with a hot cup of cocoa, gift exchanging, there are often skating holiday parties. Last year I threw a party for my students and I made up a game that seemed to be a big a hit. The rules are not exactly set as there can be leeway depending on the level of the skaters. Its a fun game to challenge the skaters, keep them skating even though its a party, and its also a great chance to get them to try new things. Rotations: The rotation cards will decide if the jumps must be a single, double, or triple. Depending on the level of the skater it could be performed two three times in a row instead of double or triple jump. If the combination card is drawn, the skater will choose another jump card. The two jumps chosen will then be performed as a combination with whatever difficult entry card was drawn. If the sequence card is drawn, the skater must make it a sequence that includes any of the following: split jumps, stag jump, falling leaf, bunny hop, side toe hop, half loop, inside axel, wally, etc. Variation/Combination: To increase the difficulty of the standard position the skater will choose from the following: variation, back (performed on the back foot), difficult entry, change foot (example: sit back sit), or combination. If the combination card is drawn, the skater will choose another spin card position to do in combination with the previously drawn position. There are no set rules to this game. The previously mentioned rules was the way my students and I played it. You can mix and match as much as you like! We would love to hear how you play! 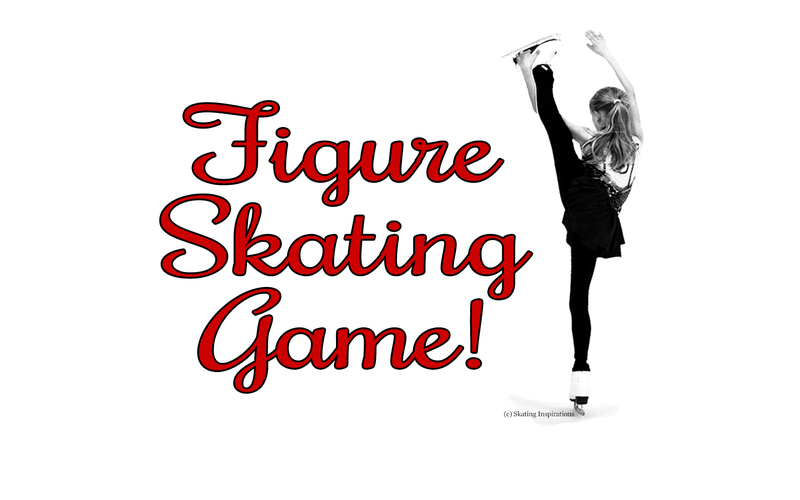 Leave a comment below or on our Facebook page and let us know how you and you skaters played the skating game!